DiscountPaint.net :: DECORATIVE PAINTS :: METAL EFFECTS-MODERN MASTERS :: MODERN MASTERS 99994 ME-149 REACTIVE METALLIC PAINT COPPER SIZE:16 OZ. MODERN MASTERS 99994 ME-149 REACTIVE METALLIC PAINT COPPER SIZE:16 OZ. 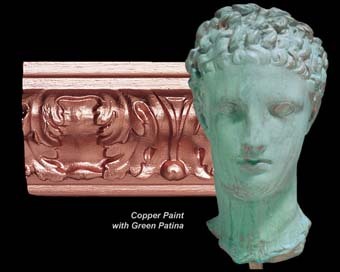 Metal Effects™ water based Copper Metallic Paint contains real copper particles. This paint will tarnish naturally over time and when exposed to the elements. Metal Effects™ Green Patina Aging Solution, when used in combination with Metal Effects™ Copper Metallic Paint, creates a beautiful authentic green patina. Metal Effects™ Copper Metallic Paint is a water-based modified acrylic paint formulated with real copper particles. It will oxidize naturally over time and when exposed to the elements. Metal Effects™ Patina Aging Solutions will speed up the oxidation process to create a beautiful, authentic, green patina on any paintable surface. Metal Effects™ Copper Metallic Paint can be brush, roll, or spray applied with an HVLP sprayer. It is ideal for use on properly prepared metal, wood, plaster, canvas, paper, or plastic surfaces. Popular applications include moldings, trim, columns, doors, furniture, rain gutters, railings, lamps, vases, and planters. Step 1: Properly prime the surface with two coats of Metal Effects™ Acid Blocking Primer (AM203) and allow to fully dry. Wait at least ½ hour between primer coats. Apply Metal Effects™ Acid Blocking Primer with a brush or roller suitable for waterbased primers. Metal Effects™ Acid Blocking Acrylic Primer is especially formulated for use with the Metal Effects™ Metallic Paints. Do not use any other primer. Two coats of primer are best, especially over metal or alkaline surfaces. Step 2: After the primer has fully cured, the surface is ready for a base coat of Metal Effects™ Copper Metallic paint. Apply using a brush, roller, or an HVLP spray gun. To spray add up to 20oz./600ml of water per gallon of paint. For brushing, use a highquality brush made for water-based paints. Allow this first coat to dry for approximately ½ hour. Step 3: In the same manner, apply a second coat of Metal Effects™ Copper Metallic paint. The Metal Effects™ Green Patina Aging Solution should be applied while this second coat is wet (within approximately five (5) minutes). Apply the Green Patina Aging Solution with a brush, sea sponge, spray bottle, or attach the spritzer cap directly to the 4 or 16 ounce Patina bottles. If an evenly patinaed surface is desired, stipple the wet surface with a brush or block stippler to evenly distribute the Green Patina Aging Solution. In approximately 30 to 40 minutes, a true green patina will appear. Cold temperatures or high humidities will prolong the patina oxidation process and dry time. Step 4 (Optional): In most applications, interior or exterior, a protective sealer is not necessary. However, if the surface is in a high traffic area or is likely to be handled repeatedly, the surface should be protected with Metal Effects™ Permacoat Patina Sealer. Note: DO NOT USE OTHER SEALERS OR VARNISHES. Permacoat can be applied by brush, roller, or HVLP spray gun. Surfaces must be completely dry prior to top coating. Begin by adding 4 oz./ 118 ml water to 4 oz./118 ml of Permacoat and stir well. Apply two coats; the second coat can be applied within ½ hour. Let the surface dry for at least one hour before handling. Note: If maximum protection from the harmful effects of UV light and weathering is required, apply MasterClear Polyurethane/Acrylic Interior/Exterior Topcoat protective overcoat on top of the Permacoat. Do not apply MasterClear directly onto the patinaed finish. This can alter the color of the patina. Coverage: ME149, 1 gallon/3.78 liters will cover approximately 300 sq. feet/28.8 sq. meters. ME149: Drying time at 70°F and 50%RH: Re-coat time is in approximately ½ hour. Dry time is in approximately one hour. Full cure is in approximately 24 hours. Lower temperature and higher humidity will lengthen the dry and cure times. Clean Up: Clean brushes, rollers, tools, and equipment with warm, soapy water immediately after use. DAP 00107 WELDWOOD CONTACT CEMENT SIZE:3 OZ. WHITE LIGHTNING 50512 WHITE TUB AND TILE CAULK (OLD 50501) SIZE:5 OZ. PACK:12 PCS. GEMINI TWP101-1 TOTAL WOOD PRESERVATIVE CEDARTONE SIZE:1 GALLON. DUTCH BOY 60015 DB16809 TNP NEUTRAL BASE T DOOR & TRIM HIGH GLOSS SIZE:1 GALLON. SHURTAPE 171376 SILVER PC460 ECONOMY DUCT TAPE SIZE:2" X 60 YD. VARATHANE 230031 GLOSS CRYSTAL CLEAR DIAMOND WATER BASED FLOOR FINISH SIZE:1 GALLON. 3M 10204-A 4-3/16" X 11" 100D DRYWALL SHEET PACK:100 PCS.